The cozy embrace of a lambswool sweater is worth its weight in cedar blocks, but even the best-laid plans can fall short of a moth’s ravenous appetite. As a devout believer in the power of thrift, Eva Kisevalter isn’t parted so easily from well-worn woolens. Recognizing that vintage goods possess a certain je ne sais quoi, but that moth-eaten holes detract from the charm, Kisevalter founded Stella Neptune, a collection of sweaters made entirely from preloved cashmere. And if your favorite cardi has succumbed to a holey plight, have no fear. 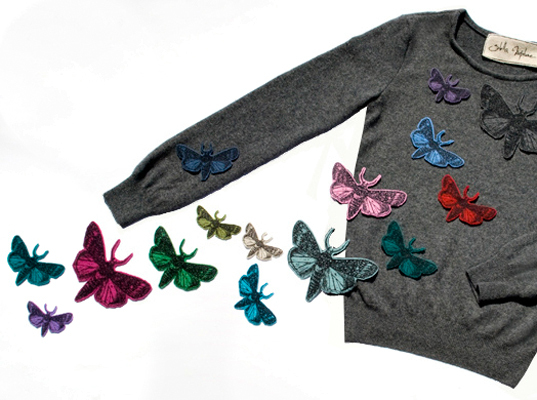 Stella Neptune also designs reclaimed-cashmere appliqués (in the shape of leaves, Band-Aids, and ironically, moths) that can be ironed onto chewed-on knits for an instant revamp. Seriously, was just going through my closet yesterday, pulled out a favorite sweater only to find it riddled with holes on the sleeves. This is perfect. The cozy embrace of a lambswool sweater is worth its weight in cedar blocks, but even the best-laid plans can fall short of a moth's ravenous appetite. As a devout believer in the power of thrift, Eva Kisevalter isn't parted so easily from well-worn woolens. Recognizing that vintage goods possess a certain je ne sais quoi, but that moth-eaten holes detract from the charm, Kisevalter founded Stella Neptune, a collection of sweaters made entirely from preloved cashmere. And if your favorite cardi has succumbed to a holey plight, have no fear. Stella Neptune also designs reclaimed-cashmere appliqu�s (in the shape of leaves, Band-Aids, and ironically, moths) that can be ironed onto chewed-on knits for an instant revamp.